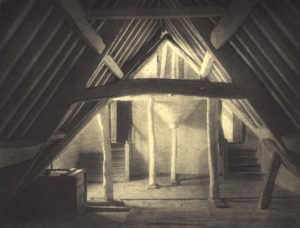 Photogravure was the technique used to print photographs in Edwin Smith’s books up until the 1960s, when it became too expensive. It was – and still is – capable of the finest reproduction of the continuous-tone photographic image via ink on the printed page, although there are very few practitioners of this complex technique working today. The article, by Alex Strasser, is reproduced here in full, together with reproductions of the photogravure plates as accurately matched to the originals as possible. 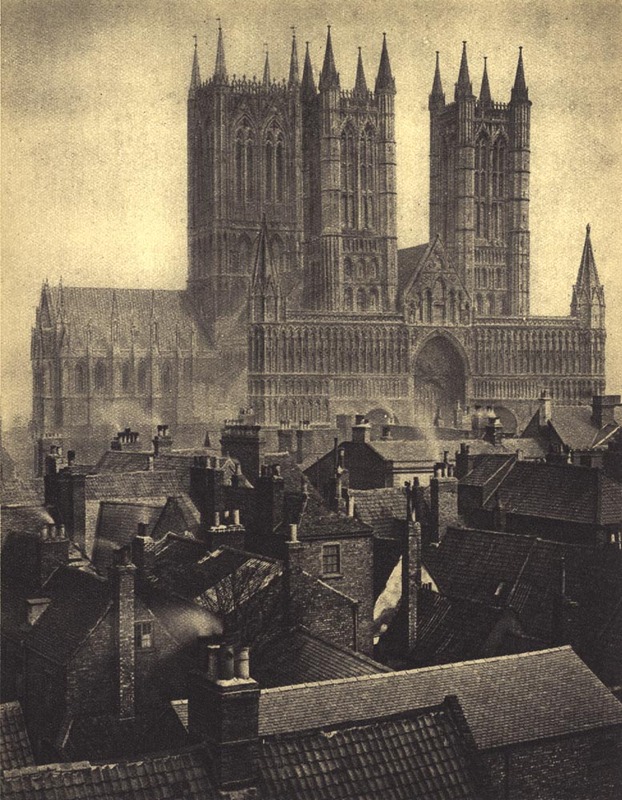 One day back in the 1890s a visitor was announced to the Dean of a well-known English cathedral. The card showed the name and address of a bookseller in the City of London. Admitting the caller, the Dean saw a small, fragile-looking gentleman wearing an outlandish silk collar, a blue tie and a crushed soft hat. ‘I have come to ask for permission to photograph your cathedral.’ The Dean, after a momentary hesitation, agreed that this could be done. ‘I shall start on such and such a day,’ calmly continued the visitor, ‘and, by the way, the rows of chairs in the nave would disturb the composition of the picture. Will you please have them removed before my arrival?’ Miracles seemed to happen even in the nineteenth century. The many hundred chairs had vanished at the appointed hour. This episode was told by Bernard Shaw in an article written many years ago, and the spirited little bookseller referred to was Frederick Henry Evans, to-day recognised as one of the few great figures in English architectural photography. To be an outstanding photographer means, on the face of it, to be consummate in this special field. But there is usually more to it than that. Photography in its early stage was certainly an eccentric form of craft. Not only did the camera obscura seem ‘obscure’ to the uninitiated, but everything to do with it was for him full of optical and mechanical mysteries, smelling partly of horrible chemicals and partly of downright black magic. No wonder that photography as an occupation attracted for a long , time not so much the respectable, level-headed citizen, but either the quack who tried to make capital out of these ‘mysteries’ or the man of sufficient imagination and foresight who was aware that the camera was not a mere conjuring tool to make fun with, but an instrument which carried in it the seed of a truly new art. Hill, Cameron, Nadar and many other pioneer photographers, later Coburn, Steichen, Sutcliffe, to mention only a few of the following generation – they all show an unmistakable affinity. As regards antecedents and general background; all are striking and often picturesque characters; all are not photographers in the sense of a chosen profession, but artists, scientists or journalists who turned to photography because, somehow or other, this strange and intriguing medium became essential – and even indispensable to the pursuit – of their aims. ‘Why should these lovely images be lost for ever ?’ It was the same question which Fox Talbot, some forty-five years before him, had wistfully pondered while glancing at the ‘fairy images’ on the ground glass of his Camera Lucida. Talbot had answered this question by inventing photography; and photography having been invented, Evans solved his problem by deciding to put photography to the service of art. He was then in his middle twenties. ‘I was a late developer,’ he says, perhaps not very seriously, ‘always ten years behind.’ Ross at that time used to give exhibitions of the wonders of the microscope for which he had built up a collection of his best slides. Some of the microscopic slides not quite good enough for exhibition were given to Evans by one of Ross’s assistants, and one day, examining the spine of a sea-urchin, Evans became particularly entranced. He tried and succeeded in making a photograph of this slide. The result seemed to him so promising that he sent the picture to the Royal Photographic Society’s exhibition, where it was awarded a medal for the best work of the year. That was his first practical step as a photographer. In these years his health suffered again seriously, and ultimately it broke down completely. It is a strange feature of Evans’s life that the mainspring of his energetic activities and achievements in various fields was his very ill-health, as it led to repeated changes of occupation. This time he had to give up his clerkship for good and think of something else. He was considering photography and would perhaps have taken it up professionally then and there had not an unexpected opportunity presented itself. Every Wednesday evening he would take a Turkish bath for his rheumatic fever, calling, on his way at a bookshop in Queen Street, Cheapside, for the weekly literary supplement of the Athenaeum, which he read from cover to cover. The owner of this not very prosperous shop, one Jones, became interested in him and grew into the habit of referring inquiries about books which he could not settle himself to the knowledgeable. young man. After a bit the unofficial assistant came to occupy an official position; he borrowed some money from his father and became a partner in the business. But in a surprisingly short time this new capital was swallowed up, and the shop was nearly on the rocks. Jones died suddenly, leaving the venture under the control of Evans, who rapidly pulled it round. One day, Bernard Shaw, surprised to see one of his books in the window (this seems to have been a rare sight in those days), entered the shop and found Evans lurking in the darkest corner of the dark establishment. ‘You are selling my books,’ he said. ‘Why not?’ answered Evans, and they became friends. Evans had, and still has, the greatest admiration for Shaw. ‘We who have read every word he has written,’ he says with pride, implying that to have read Shaw is the highest of intellectual distinctions. 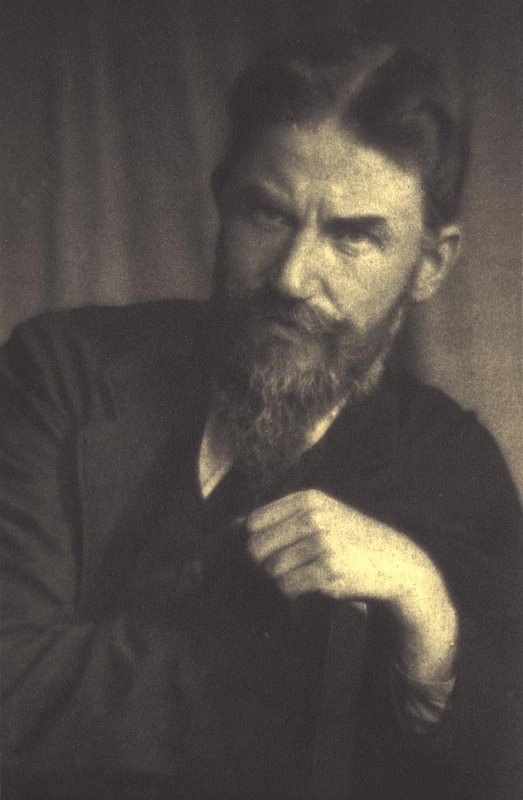 Shaw, for his part, recognised in Evans the artist of marked ability and bizarre character that he is. Shaw was not the only star in England’s intellectual sky whom Evans knew not merely through the books which he read and sold. There was William Morris. Evans still keeps amongst his treasures a number of Kelmscott books with Morris’s signature, which he points out to his visitors with great pride. And there was a young insurance clerk by the name of Beardsley, who used to rummage in the bookshop during his luncheon hour so as to forget for a while the drudgery of his existence. Evans took a liking to the young man and soon found out that Beardsley also was possessed of a passionate love of beauty and music. Beardsley felt that he could trust Evans and showed him, rather embarrassed, some drawings he had made in his spare time. That Evans believed in Beardsley’s talent from the very beginning is proved by the fact that he often swopped books which Beardsley wanted for some of his first drawings. Evans remained Beardsley’s friend and counsellor, and remembers many small incidents. Once Beardsley showed him a drawing of Madame Rejane which he had made for the Yellow Book. ‘Fine work. How much is it worth?’ asked Evans. 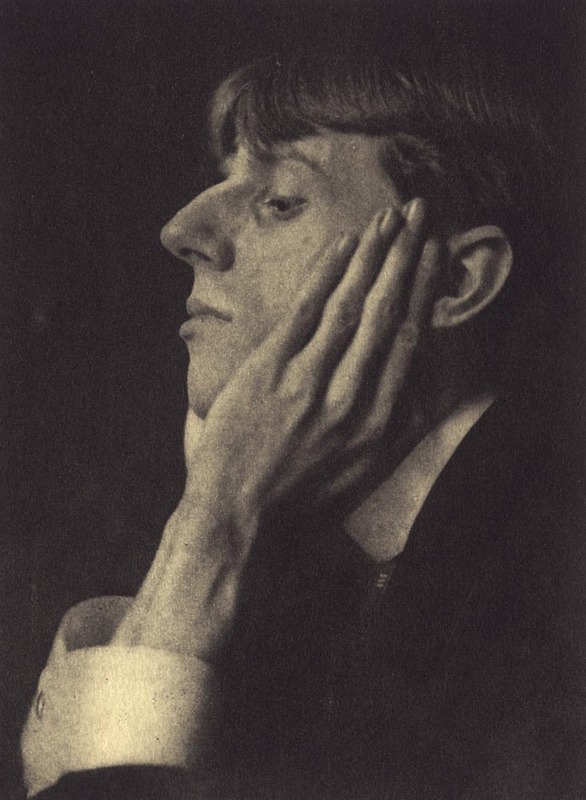 ‘A fiver,’ replied Beardsley. E. gave him a five-pound note and B. tucked it into his handkerchief pocket. E.: ‘It will get lost.’ B.: ‘It won’t.’ On the following morning Evans received a postcard from Beardsley: ‘Where is that note?’ Evans replied, ‘That’s the sort of lost property no one ever returns.’ He sold this Rejane drawing later for £100. ‘Every morning I opened the bookshop with the fear how much less of me would come out of it in the evening.’ He was afraid that he himself would be swallowed up by his shop. 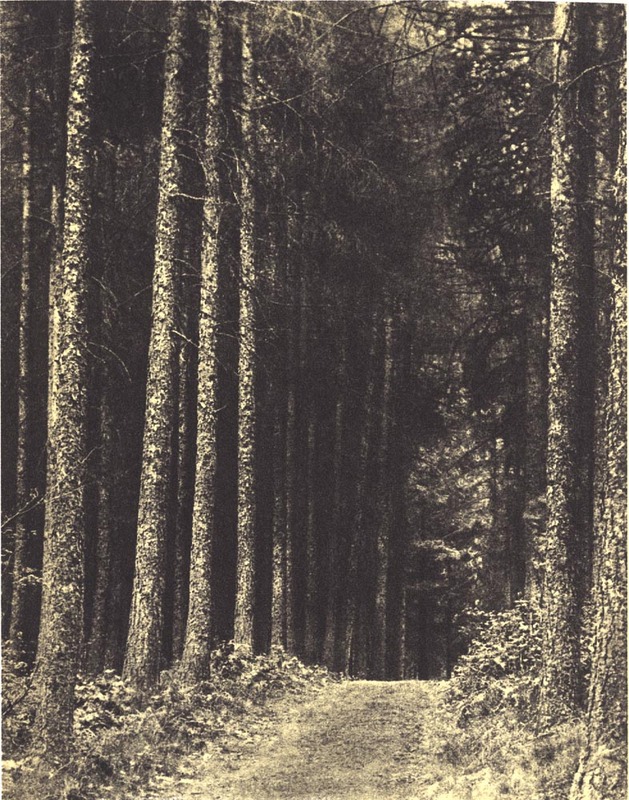 So at the turn of the century, Evans, exhausted, renounced his career as a bookseller and moved out of London to Epping Forest to take up, at last, photography on a large and unhampered scale. To speak of him as a photographer, and to. show his work in the right place and perspective, one needs briefly to explain the position of photography in general between say, 1890 and 1914. This period is characterised by several distinct features. There was a rapid advance on the technical side, there was a steady decline in professional portraiture brought about by a glut of inferior studios, and there were renewed attempts on the part of intelligent photographers, mainly amateurs, to lift photography from the plane of a mere mechanical craft to an acknowledged art. These attempts were natural and logical developments, but a strange confusion arose as regards the ways and means by which to attain this end. Two distinct schools are discernible. The first regarded it as perfectly legitimate to draw on extraneous resources, such as pigments, for the achievements of their ends. The technique of ‘controlled’ printing was their mainstay, and there is no doubt that very artistic effects can be obtained by the gum process, the gum-bichromate process and the oil and bromoil processes. The doubt comes in over the question whether these artistic effects are art or any nearer to it than a photograph pure and simple. The question has never been, and probably never will be, ‘officially’ decided. But the followers of group two maintain stoutly that photographic art can only spring from pure photographic reactions, physical and chemical, and that the negative is decisive, not the print which, in their eyes, is secondary in importance. Be that as it may, one fact is certain: a good print can never be obtained from a bad negative by straight printing methods, whereas quite impressive pictures can be wangled from almost hopeless negatives by the pigment technique, In other words, the ‘pure’ photographer must be a good photographer, the adept of controlled printing must be clever with his pots of pigments, glue and oil. Evans is, and takes a great pride in being, a ‘pure’ photographer. He never reduced, intensified or retouched his plates. If he was not satisfied with a negative he smashed it. He printed on platinum paper. ‘We artists are at the mercy of our material. If I had not had double-coated plates and the platinoprint, I would not have touched photography again.’ He attributed to this combination his ability to express himself as he wished, to combine in one picture strongest high-lights and darkest shadows without losing any of the delicate half-tones which are so characteristic of his work. Evans was, as in all his other pursuits, entirely self-taught. He proceeded by observation, self-criticism and boundless energy. His cathedral pictures are a good case in point. During one of his sojourns in Devonshire he said to himself: ‘I’ll return by way of Salisbury and see what a cathedral looks like.’ This visit was decisive. 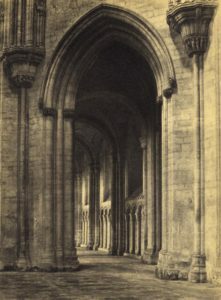 It prompted him to engage in photographing cathedrals, He emphasises that this had nothing to do with any devotional feeling – it was simply the appeal of beauty which actuated him, in this case mainly tile beauty of stone texture. He studied the problem and, somewhat facetiously, remarks that ‘cathedrals are very good subjects for students – they don’t walk about.’ From this period of studies and observation he went on to the next stage of self-criticism. Having made up his mind about the fundamental questions, Evans began his work. Shaw’s story, told at the beginning of this contribution, gives a fair idea of the way Evans set about a problem. The difficulties which confront photographers in the architectural field, and especially in churches, are considerable. Evans had often to wait for weeks until everything was as he wanted it: the balance of light and shade just right, the sunlight streaming through a window in the desired intensity, the atmosphere conditions creating a right perspective and obstacles where possible, put out of the way. Even then many problems remained, such as local difficulties and the question as to how to establish the grandeur of a large composition without distortion or magnification of near portions. The use of long-focus lenses was often impossible because of limited space. Ladder-tripods had to be used for getting nearer to details high up the walls. Evans used to take his first pictures with a tiny hand camera for plates 3 1/4 in. square. 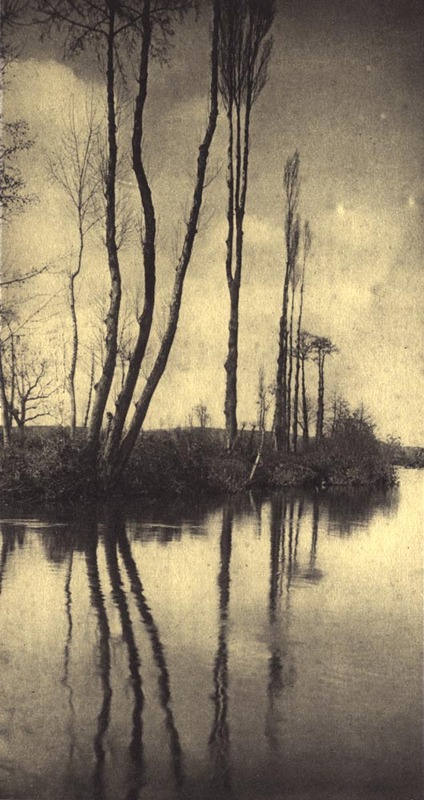 While lamenting this fact he felt consoled by his recollection of Turner’s small water-colours, which proved that ‘acreage has nothing to do with art.’ Later on, he used cameras from half-plate to 10 by 8 in. size and a variety of lenses ranging from 6 in. focal length to the telephoto lens. His greatest care was directed to the exposure times; they varied between several seconds and several hours, and he always used the largest aperture possible. 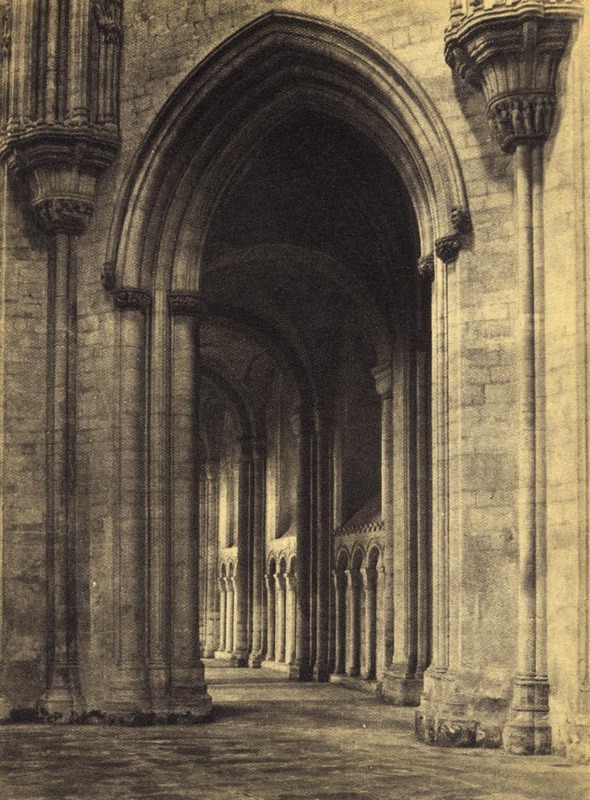 ‘Wrong exposures lead to trying the impossible task of improving a bad negative into a good one.’ For certain purposes, such as the interiors of Westminster Abbey which he made in 1911, he used specially prepared emulsions, all double-coated. No available plates would have given him the necessary control over such lighting extremes as prevail in the Abbey. 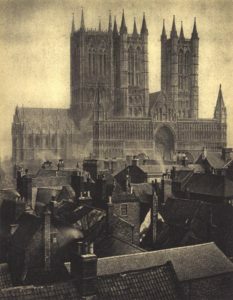 He took countless photographs in most of England’s important cathedrals; in some cases he was commissioned, but mostly he· worked on his own accord. All his work shows his supreme technical skill and uncommon gift of ‘seeing.’ Although his name is mainly associated with the photography of cathedrals he was a master also in other fields. Three times he went to France on special commissions and photographed the majority of her famous chateaux. He liked landscape photography and was very much attracted by wood scenes. 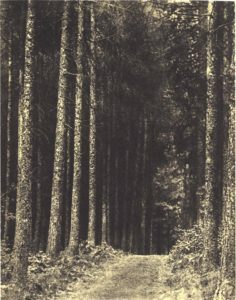 The tall uprights of the trees in his picture ‘Dirge in Woods’ are strikingly akin to the pillars in the picture of Ely Cathedral. Evans took also, though to a lesser degree, photographs of his friends. His best known portrait is that of Beardsley. He was at first puzzled to know how to tackle him. ‘There’s not much to be done with a face like yours,’ he told him. ‘You’re only a gargoyle, you know.’ Beardsley at once put his hands up to his face in the attitude made famous by the subsequent photograph. ‘That’s It ! A gargoyle on Notre Dame,’ exclaimed Evans excitedly, and made the exposure. Evans was, of course, paid when he was commissioned, but he never took on any work for the sake of payment. He declined many attractive offers. ‘I always had my bread and butter. I wanted to be free.’ And free he remained, an independent but modest and retiring sort of man. Although a member, and later an Honorary Fellow, of the Royal Photographic Society, he never took any great part in its activities. Shortly after the last War, when it became more and more difficult and costly to obtain platinum papers, he gradually, and probably mournfully, gave up his beloved photography. Thus and thus has Evans become the nonagenarian that he is today. That is almost an achievement in itself, but he does not seem to take much notice of it. He is mentally as active as ever. In his neat house in Acton, with his wife and daughter, he leads a quiet but still rich and full life. Small, gnome-like, a fringe of white hair covering cheeks and chin, wearing a black velvet jacket, a blue silk tie, slippers and, occasionally, a skull cap, he skips round his room with immense agility, busying himself with many things. He is still interested in current literature, but for real relaxation he turns to his pianola, for which he has himself cut 1500 rolls of music. His rooms are filled with numerous treasures which constitute his links with the past. Paintings, drawings and photographs crowd the walls. A strange-looking mechanical contraption of uncertain purpose in one corner and the roll-cutting machine in the other are puzzling to the casual visitor. Evans regards his photographs as his greatest treasures. And he is right. As things are, the cathedrals of England are in danger. His pictures will forever reflect their beauty. They are the contribution of a true artist to his country’s culture. Saturday Book Editor’s Note: While this book was in preparation Mr Evans died: on June 24, 1943, two days before his ninetieth birthday. All his friends, and they range over three generations, mourn the loss of a remarkable and endearing personality who brought to the twentieth century the essential qualities of the great Victorians. Reproduced from The Saturday Book, Number 3, published in 1943. 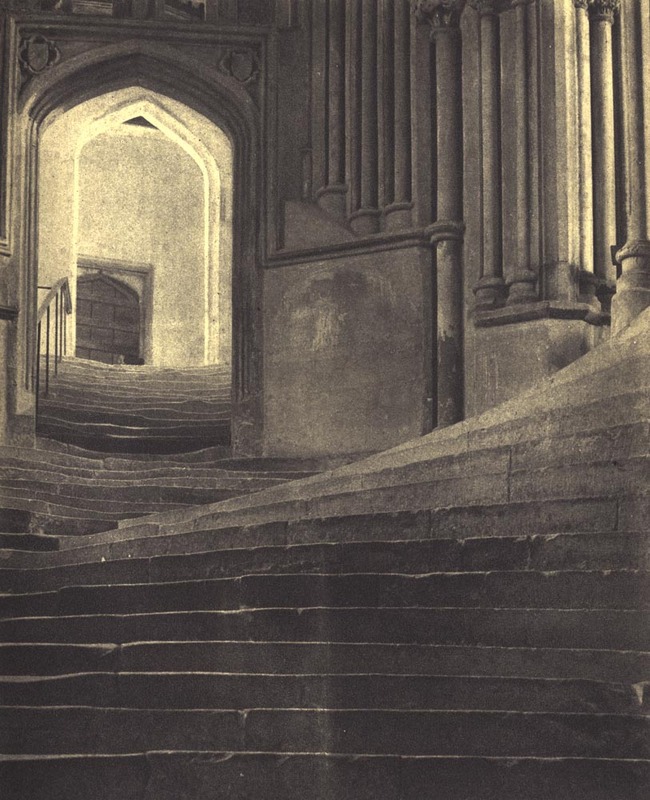 Editor’s note: A comparison between Evans’ photograph of the ‘Sea of Steps’, alongside Edwin Smith’s version and my own, may be seen in this article.